This study looks at how our genes affect how our brain develops. It focuses on a gene called TAOK2. Researchers used mice as animal models to understand what the TAOK2 gene does. Some of these mice had either one or both of the TAOK2 genes removed. Researchers could then compare brain cells, brain development and the behaviour of mice with both copies, one copy and no copy of the TAOK2 gene. But, this was not enough. What the TAOK2 gene does could be different in humans than it is in mice. Researchers thought the TAOK2 gene could be related to neurodevelopmental disorders (NDDs) like autism spectrum disorder (ASD). Researchers checked by looking at the genes of families with ASD. Researchers then analyzed how the TAOK2 gene affected the development by creating brain cells from blood samples taken from these families. By analyzing these cells, researchers could look at how TAOK2 influences brain development and NDDs like ASD. By understanding this process, new treatments could be designed to repair this difference. Researchers observed the behaviours of these mice and had them complete specific tasks. They also took pictures of their brains with an MRI (magnetic resonance imaging). Researchers recorded the electrical signals from brain cells. Brain cells use electrical signals to communicate with each other. Analysis of these signals tell researchers how these cells are functioning. Researchers also looked at these cells using advanced microscope technology. Each part of the cell serves a particular function. Therefore changes to these components can change cell function. For each of these experiments, researchers compared the results from mice with both, one or no copies of the TAOK2 gene. This was to understand the effect of no loss, partial loss and complete loss of function of the gene. Researchers then needed to understand if these results in mice matched what is seen in people. To do this, they obtained the DNA of over 2600 families with ASD. If the TAOK2 gene was a gene responsible for brain development, researchers might see changes to this gene in families with ASD. Researchers analyzed their DNA to search for these changes to the TAOK2 gene. When changes to the TAOK2 gene were found, researchers used participants’ blood to create new human cells. Researchers could then run some of the same experiments on these cells that they did on the mouse cells. Pictures of the brains of mice with one or both of the TAOK2 genes missing showed changes to the growth of brain regions (Figure 1). These mice also showed problems with anxiety, social behaviour, and short-term memory. However, mice with the missing genes did show better long-term spatial memory. Brain cells with missing genes also looked different under the microscope. They were missing pieces (neurons had less dendritic branching) that they use to communicate with each other. These changes were bigger (dendrites were shorter and less complex) when both genes were missing than when one copy of the gene was missing (Figure 2). Some of the families with ASD showed changes to their TAOK2 gene in their DNA. Human brain cells were created from these samples. The changes to the TAOK2 gene in families with ASD affected the structure and function of the cells. The changes were similar to changes seen in the mice missing one or both TAOK2 genes. Researchers then discovered how the TAOK2 gene signals the development of human and mouse brain cells. This signal looked like it caused the development of certain cell pieces (development of the dendritic spines and synapses) used in cell communication. To test this theory, researchers gave a drug activating this signal to mice missing both TAOK2 genes. The brain cells of these treated mice were analyzed using some of the same experiments used above. These cells then looked and functioned much like cells from mice with both TAOK2 genes. Therefore, by activating this signal, researchers were able to undo many of cell changes related to loss of the TAOK2 gene. Figure 1: Pictures of the brains of mice missing the TAOK2 gene (KO mice) and mice with the gene (WT mice) taken with an MRI. 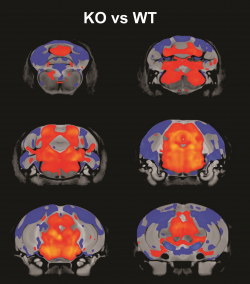 Colours show KO mice have an overall larger brain volume. Figure 2: Pictures of the brain cells of mice missing the TAOK2 gene (KO mice) and mice with the gene (WT mice) taken with a microscope. 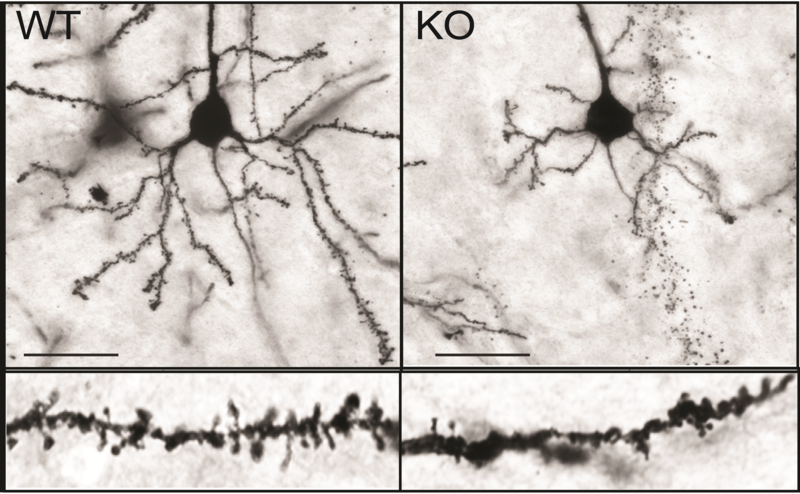 Cells from KO mice show shorter and less complex dendrites. The TAOK2 gene is involved the development of the brain and its cells. This gene is altered in some people with autism spectrum disorder. These gene alterations change the development of some of their brain cells. These changes affect how the cells communicate with each other. This may influence some of the changes in brain structure and function seen in people with autism spectum disorder. This is suggested by changes in the brain and changes in behaviour seen in mice missing the TAOK2 gene. Further research on the effect of TAOK2 in neurodevelopmental disorders is needed. However, this study reveals that TAOK2 is a risk gene for neurodevelopmental disorders. These findings may help in developing new treatments to target changes caused by the TAOK2 gene. It may also help identify who will respond best to different treatments. The full research article was written by M. Richter and colleagues, and was published in Molecular Psychiatry in February 2018.